Wow. It's that time of year again. That one glorious moment when the fountain pen show rolls through Philadelphia and I get to geek out. This time I convinced some other dorks from the West Philadelphia Runners that we ought to RUN to the pen show, because, hey, it's miles and miles away and it was like 25 degrees out. So Flint Weller and I zoomed off, taking the opportunity to run past the Rocky steps, though we didn't run UP them this time. It was two giant rooms of tables filled with old pens and new. 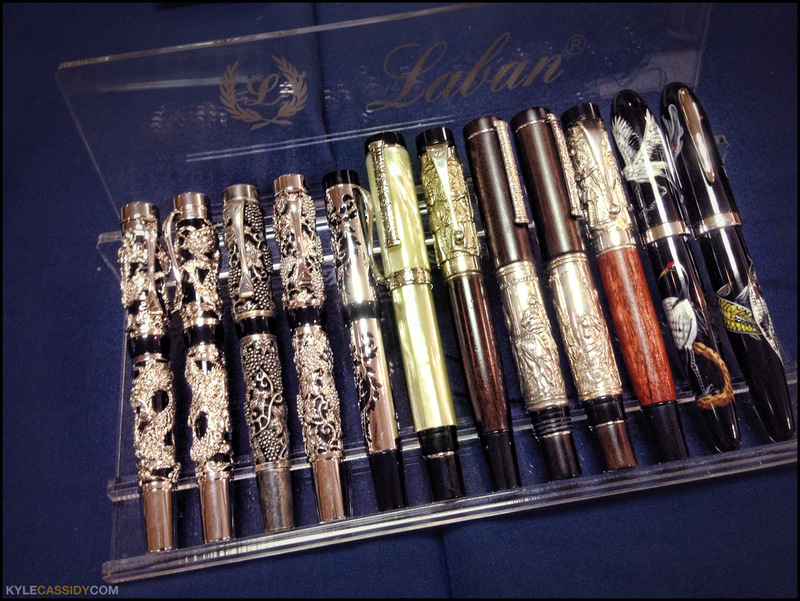 Some pens are very humble, made to do a journey(wo)mans work and others are incredibly ornate. Some of the ones that grabbed my attention first were these from Laban. They all look gloriously epic. The kind of thing you'd write something monumental with. 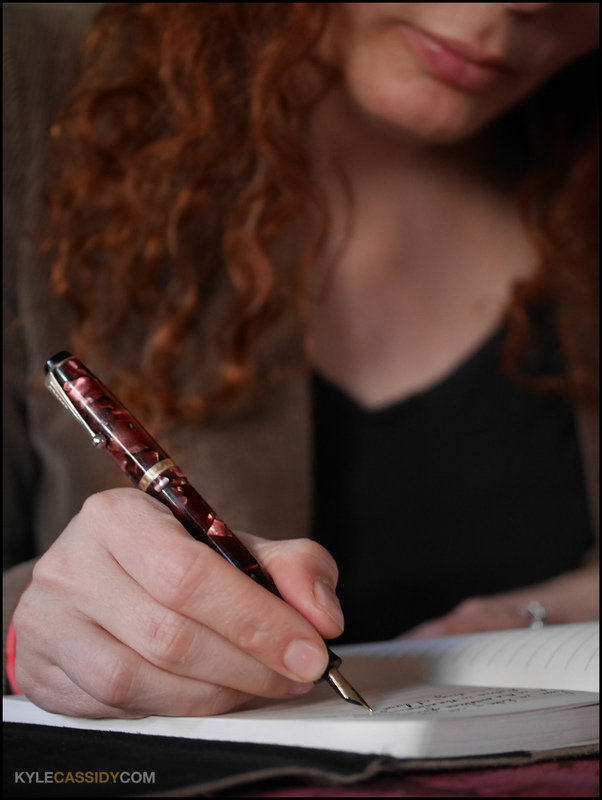 Though in actuality most of the pens that actually end up doing monumental things aren't any of these, because they're not terribly comfortable to write with. These were the absolutely cheapest pens you could get that were a) made in America and b) not a complete joke. They were half plastic Parker T-Ball Jotters -- they probably cost about 30 cents each in bulk. There are also "gift" pens that come in presentation boxes and I guess have a similar history. "Thanks for coming to the White House Mr. Billikngsplobke, here's a pen." He also had some pens used to sign nuclear treaties and these were serious Parker Dufolds -- expensive pens for important things. I didn't ask how much any of them were, but it was interesting. I wasn't planning on getting anything because, you know, I have enough pens. But towards the end two things jumped out at me -- mostly because they were pretty and not expensive. 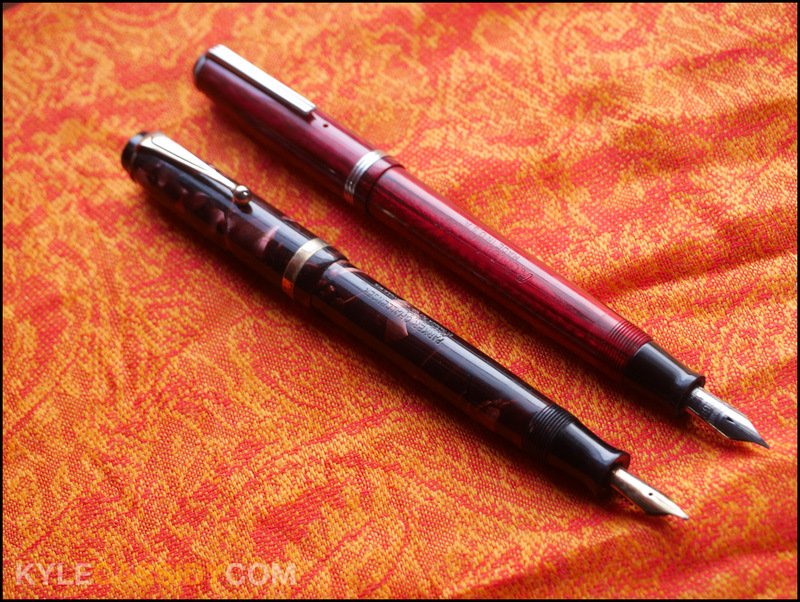 A Parker Challenger (left) and a red Esterbrook J, from sometime between 1943 and 1948. I only have one parker pen which I got as a gift while I was in college. 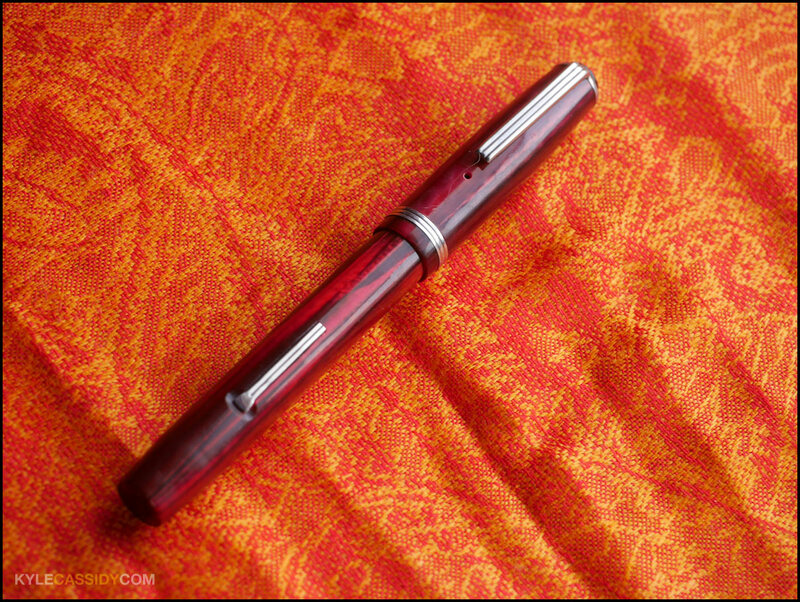 It writes wonderfully and it's a very well respected pen maker and has been for a long time. 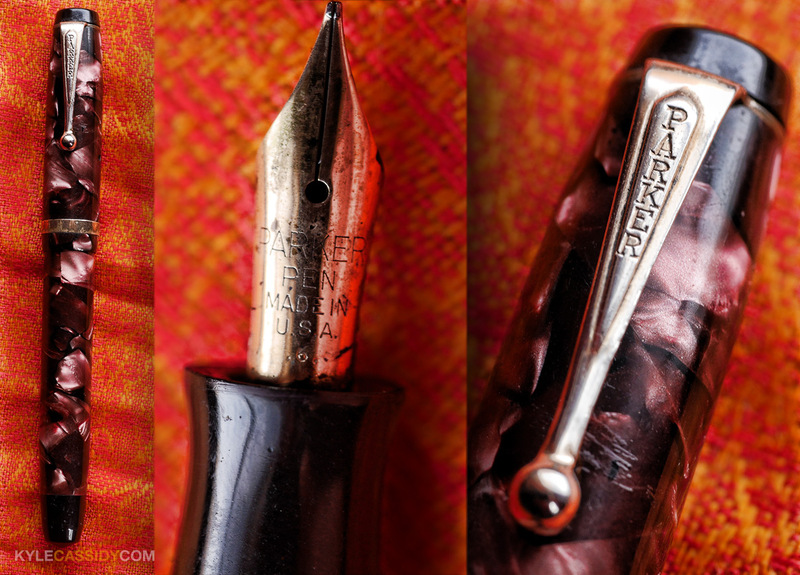 The vintage Parkers are mostly expensive and when faced with the challenge, I usually get an Esterbrook that writes just as well for a tenth of the price. But then, there was this Challenger and a guy who didn't want to have it anymore. So now it lives with me. It was made in the spring of 1936, which you can tell by the date stamp on the barrel. It says "26" which means the 2nd quarter of the year 1936 -- at that time the Palestinian uprising had just begun, Italy invaded Ethiopia, forcing the Emperor to flee, Joe DiMaggio played his first professional game, the Presbyterian church was founded, here in Philadelphia, Jesse Owens sets a world record in the 100 meters and Gone With the Wind hit the stands. Also Pope Pious XI write his encyclical "On Motion Pictures" which you can read here. 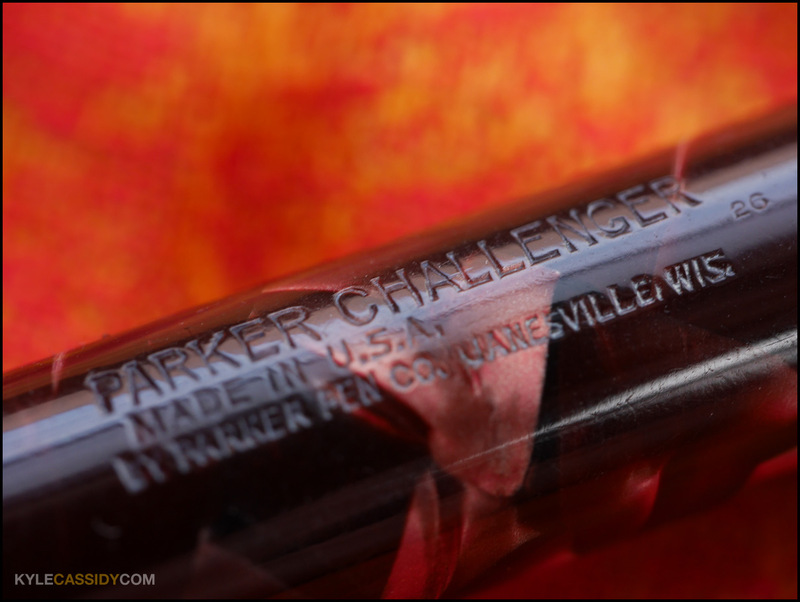 The Parker Challenger was their mid-level gift pen, it retailed for $2.75 (about $38 in today's dollars) and they were typically called "school pens" -- when someone graduated from high school, grandma and grandpa would give you a fancy pen to take to college with you (but of course, not always -- sometimes you just buy yourself an expensive pen). The guy who sold it to me told me that pens were one of the visible means of displaying status and sometimes people would buy the cap for a pen that they couldn't afford and just wear the cap in their pocket like an up-ended social status iceberg. So that's almost that. Since I brought two pens in, I want to get rid of two pens, since I don't want to be the guy with a thousand pens that never get used. Keep your eyes peeled in the next couple of weeks. Betwixt Neil and you I am developing a high level of love for the fountain pen. Sadly, I don't know that there are any fountain pen shows near me. Watch a presidential signing ceremony sometime. Clinton was the first I noticed doing it - signing his name with a different pen for each letter. They get given to high-power donors, to the party to auction off as fundraisers, etc. I love that you are also a fountain pen guy (I'm a Cross girl myself - hometown pride). Recently someone showed me a pen that you could kill someone with. My immediate reaction? But, it's ballpoint - why bother? My favorite school field trip ever--even better than the Chrysler plant or the Brookfield Zoo--was to the Parker Pen factory in Janesville, Wisconsin. I saw them make pen nibs and barrels, and our guide told us about how the different materials for nibs affect the way the pen writes and feels. We got to see modern pens and vintage pens, gold and platinum and stainless nibs, cartridge pens and reservoir pens. That was the only field trip that ever made me want to get a job at the place we were touring. The Janesville plant is closed now, which makes me sad. No more Midwestern kids unexpectedly discovering the marvel of writing instrument manufacture. google "[name of nearest city] fountain pen show" -- there is one. Not that my google-fu can find :( Though my local fountain pen dealer seemed very excited about http://www.fountainpenday.org/ that's not exactly the same thing as a pen show. Alas. what is this thing of which you speak, "have enough pens"? fountain pens are a love of mine. i have my maternal grandfather's parker fountain pen that he was given as a gift after leaving the navy. it is one of my most treasured possessions. i bought my husband a parker from...somewhere in norwich, england, as a wedding present, and at the time it was a beautiful antique. i think i would get lost at a pen show. the dragon pen is lovely, but i am taken with the pens with the birds painted on at the far right. how lovely. there is nothing like using a fountain pen. it is like a ritual, one that is ages old. i've even taught my kids how to make a quill pen from one of our birds dropped feathers(a flight or tail feather) and they get a kick out of using them. anything to make homework fun! Pen shows, physically, are smallish, so you won't get lost. And everybody's friendly and helpful, so if you do, they can spin you 'round to the right direction again. Also, you have excellent (and, sadly, expensive) taste. 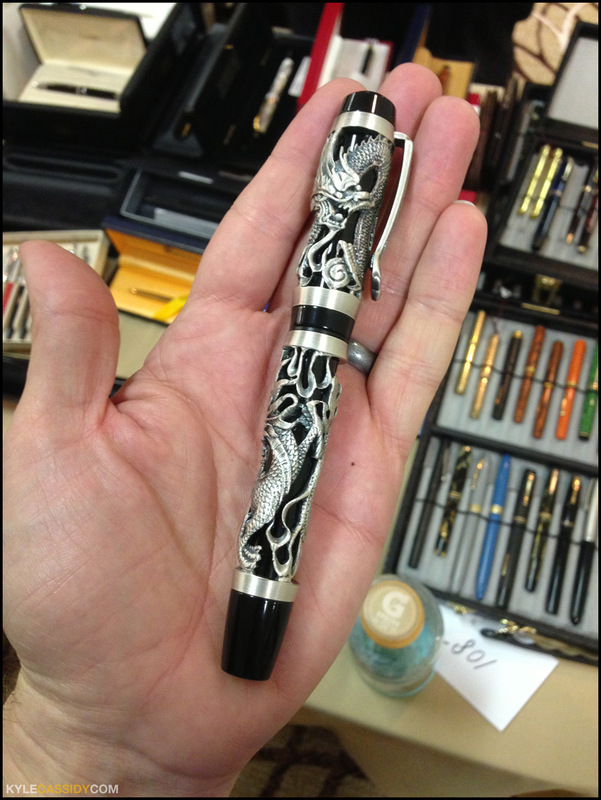 Maki-e lacquered pens tend to cost far more than overlays (like the dragon pen). [sigh]. I'm too cheap to do much more than fish about in parts bins at pen shows. But it's kind of glorious to be able to do so. I once picked up parts to make a Frankenpen (found a penless cap and a capless pen) Waterman 52 with flex nib for Neil. Cost a grand whopping $25 total. So, naturally, he lost it. [facepalm] No wait. I lie. That wasn't the Frankenpen. That was the pen I gave him that replaced the Frankenpen (because he lost it--I had a second one for him, because we were going to auction off the Frankenpen at Fiddler's Green for the CBLDF but, well...). If he loses that third 52 I gave him, I swear, he's not getting a fourth one from me (at least not until he finds that Parker 51 I gave him). I'm just sending him to Goulet Pens for one of Nathan Tardif's Noodlers $14 flex nib pens (they're more semiflexes than flexes, but at least there's an endless supply and they're cheap). For everybody looking for a pen show, here's a good list of European and North American penshows with links to the individual shows websites: http://fpgeeks.com/pen_shows/. The LA Penshow is traditionally held at the Manhatton Beach Marriott over Presidents' Day weekend (Valentine's Day), so I never have an excuse to forget when/where it's coming up. Argh. You are being cruel. I have somehow managed to misplace my left-handed fountain pen some time last week; and I've been stuck with sticky, horrible ballpoints since then. Happily, tomorrow I get to replace the pen, and see if the shop has managed to fix my Parker. "The Presbyterian Church" was founded long before 1936. That was simply the year of the schism that produced the very-conservative Presbyterian Church in America. The first American presbytery was founded in Philadelphia in 1706. What you seem to have overlooked is that 1936 was the year that Tom Purdom was born! Hi Kyle! I was pointed to this entry of yours by the lovely grammardog, who came to your LJ, she tells me, by way of slutmuphin, who I'm also lucky enough to be able to call my pal. CJ brought Sara to my wedding in PA as a wedding gift - I'd never been given a *person* as a gift before, and Sara was a lovely person to be gifted. Alas, she had to go back to Canada after the wedding weekend was over... ANYWAY, the reason G'dog pointed me to this entry is because we (you and I) have two connections: one, Pennsylvania - I grew up in Bucks County, PA - and two, fountain pens! I now live in Scotland with my fountain-pen-mad husband the_pilchard who never posts anymore on LJ. But after moving here, with his help I started up a fountain pen blog as well as a wee online shop, both mainly concerning British pens. 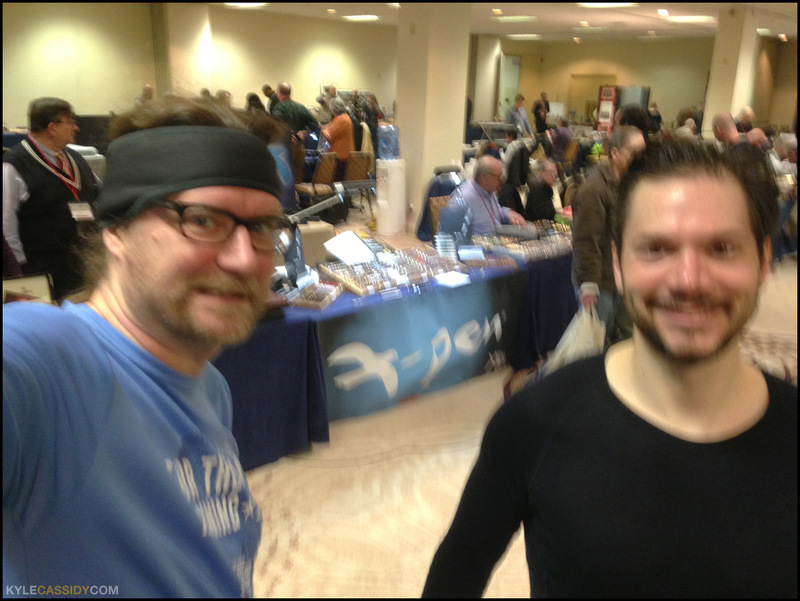 I'd heard the Philly pen show was this week and wished mightily we could have been there. We're so far up in the Highlands that going to any pen show would require hundreds of miles of traveling (or thousands, were we to go back to Philly), so we haven't been. Boo! In any event, I just thought it was cool that grammardog sent me the link to your post - I really enjoyed reading about the show and the pens through the eyes of a fellow enthusiast, it's nice to geek-out-by-proxy, and I thought I would say hi. I've linked to my blog on the chance that you might find it interesting and/or entertaining, and posted here because it's always nice to find another fountain pen person floating around out there in the world! You've picked up a couple of really lovely pens, and I admire your "two in, two out" method of not becoming that crazy fountain pen guy. Our house has, at any given time, a couple hundred fountain pens in various states of restoration / sales readiness (and many, many bits and pieces in the spares box! ), so I'm kind of a crazy cat lady only with fountain pens. They are such lovely things, my favorites are the 100 year old pens that write like the day they were purchased originally, with lovely flexy lines and all that history. My ultimate favorites are the ones which have a back-story, the all-time favorite being a pen that came in a box, on the bottom of which had been scrawled, "you want to watch this bloody pen!" I always wondered how many shirt-fronts that pen had ruined, in order to garner such a warning, sent down through time.